Sheng Yu (1692-1767) was born in Changshu, Jiangsu province. 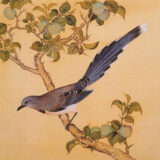 He was the court painter in Qing dynasty and his principle subjects were flowers, birds, fish and insects. His paintings are not only considered to have artistic value, but also to provide an important directory of wild life. 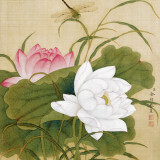 Classic Artist Zhi Yu, was born in Changshu, Jiangsu in the 18th century. 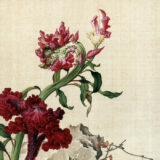 He was a dedicated Court Painter and worked for the Qian Long Emperor as a government servant. His drawing is in an academic style and is inspired by nature including flowers and birds, fishes and insects, which are painted vividly with fine feathers and graceful movements. Zhang Xuan (713-755) was a Chinese painter who lived during the Tang Dynasty (618–907). 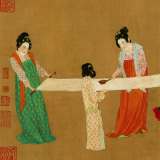 Although he painted many artworks, he was best known for the painting Court Ladies Preparing Newly-Woven Silk, of which no copy survives except a reproduction painted by Emperor Huizong of Song (reigned 1100–1125) in the early 12th century. Kanagawa. 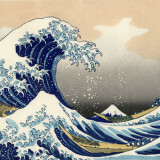 Hokusai (1760-1849) was a Japanese artist, ukiyo-e painter and printmaker of the Edo period. In his time, he was Japan’s leading expert on Chinese painting, and this print is taken from the series ‘Thirty-six views of Mount Fuji’. Utagawa Kuniyoshi (1797-1861) was one of the last great masters of the Japanese ukiyo-e style of woodblock prints and painting. 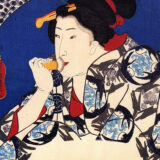 The range of Kuniyoshi’s subjects included landscapes, beautiful women, Kabuki actors, cats, and mythical animals. He is known for depictions of the battles of legendary samurai heroes. His artwork incorporates aspects of Western representation in landscape painting and caricature . Kitagawa Utamaro (1753-1806) was a Japanese artist. 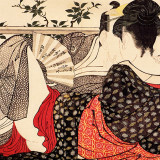 He is one of the most highly regarded practitioners of the ukiyo-e genre of woodblock prints, especially for his portraits of beautiful women. Utamaro’s work reached Europe in the mid-nineteenth century, where it was very popular, enjoying particular acclaim in France. He influenced the European Impressionists, particularly with his use of partial views and his emphasis on light and shade, which they imitated.